If you’re selling or applying vinyl wall graphics, here’s an important update. We’ve been recommending the use of Main Tape Preview Plus GXF101, a high tack clear tape, for most of our customers selling vinyl graphics for interior decor. Wall graphics present unique challenges for transferring vinyl graphics, especially when the substrate is a textured, painted wall. Previous testing had demonstrated that GXF101 worked best at removing ORACAL 631 vinyl from its release liner and transferring it to walls; especially the textured porous walls common in our region. Because of customer feedback and changes in the industry, we tested Main Tape’s Preview Plus GXF101 high tack transparent transfer tape against its medium tack variant, GXF100. Based on our testing, the GXF100 is a better option, not only for textured surfaces, but also for transferring vinyl to ultra-smooth substrates like glass. What makes Preview Plus GXF100 such a great product for wall words? 1) Optical Clarity Preview Plus GXF100 is one of the few products in the sign industry that was specifically designed for interior walls. It addresses the needs of this challenging market in several ways, but the two most important are its clarity and adhesive properties. 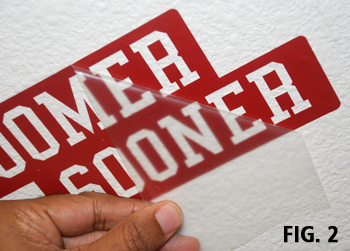 Many graphics professionals and hobby users prefer clear tape because it gives the installer ideal visibility for precise placement of the graphic. It also looks better if you’re selling “do it yourself” graphics because the customer can clearly see what they purchased in full color without the dulling effect of paper tape. This enhances the buying experience. 2) Selective adhesion The greatest thing about GXF100 is that it strikes a perfect balance between release and transfer, especially on textured walls. It helps pull 631 from the release liner almost effortlessly, making the old ORACAL flip unnecessary (I should also note here that EnduraMATTE vinyl offers many of the benefits of ORACAL 631, but is easier to remove from the liner). Then, when it’s time to apply the vinyl to a wall, because it’s a lower tack tape, it releases its grip on the vinyl more easily. This allows installers to remove the tape without automatically pulling the vinyl letters off the wall. With these challenging wall surfaces, even the best of tapes may require some technique to complete the transfer. 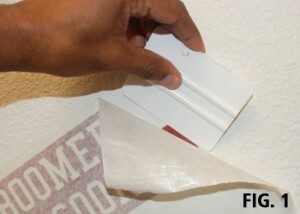 If you’re applying vinyl to rough walls, the low contact area between the substrate and adhesive may require you to work the tape off gradually, using your squeegee to press the vinyl to the wall as you remove the tape (Fig 1). When applying graphics to smooth surfaces this is not necessary. Simply pull the tape back along the surface at at 180° angle. The vinyl stays flat and you’re done! (FIG 2). The more porous the surface, the more challenging it will be to transfer small characters or elements. When designing a graphic for porous surfaces, the bigger the contact area between vinyl and wall, the more secure the bond will be. And the easier it will be to complete the transfer. If you’re using GXF100 or any of the paper tapes recommended for wall graphics, and still having trouble getting the vinyl to adhere to the wall as the tape is removed, it may be because your design is too small or intricate. If you prefer paper tape, there are several options for wall graphics including Main Tape’s medium tack PerfectTear Plus GXP750, ORACAL HT-55, and R-Tape’s new 4078RLA.